It’s thru-hiking season, ya’ll. The journey has already begun for thousands of people attempting to complete a long-distance hike for many different reasons. Social media is ablaze with pics of hikers, trailhead signs, gorgeous (but repeated) mountain and landscape views, and, of course, gear photos. Everyone is smiling and happy and life is good. Attention! Attention! Attention! Code Red. Code Red. All patients and visitors please remain where you are until directed by a hospital employee. Attention! This is the deafening alert that is screaming at me for 20 minutes at work, interrupting my daydreams about the trail. I have just days until I’m dropped off in Harpers Ferry and my thoughts are consistently thinking about what I have left to prepare. Since I’m working until the last minute to save the most amount of money, my time to be productive is limited. I’m still in the process of packing and selling my home, paring down my bills, changing my address and storing my car, saying farewells to friends and family, already missing my dog, and having a mental breakdown. I’m certain there are a million things I haven’t done and I’m definitely going to forget something stupid, like toilet paper. Side note: Alexia, don’t forget toilet paper. I’ve been doing intense interval training workouts, going on local hikes with my bag packed with my gear and kettlebells to simulate food weight, testing my stove, breaking in my shoes, and it’s all going right. At least the big stuff, right? Somehow it’s the small things that are stressing me out the worst. Organized and pristine, the legendary gear photo and list from many different hikers are what helped me decide on my gear selection and purchases. And so here I am, ready to organize my gear to look pretty like everyone else’s, and it is NOT working out. I’ve got my first aid kit here to my left, my camp clothes to the right, water treatment in front, cooking stuff in my lap, this other stuff behind me, this other OTHER stuff next to me, my buff on my head, and there are things freaking everywhere! This does not look anything like what I was aiming for. I can’t think straight. My mind is racing. And my heart… is beating… out of my chest at record speed! Panic mode: Engaged. I get up and leave the room. It looks so simple for everyone else. It’s not like I haven’t put in the work. I know where everything SHOULD go. 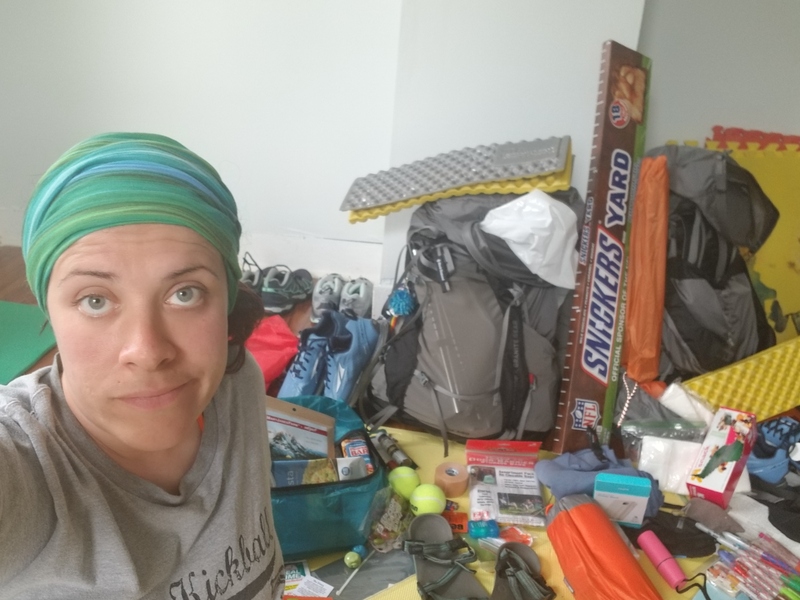 But if I can’t organize my gear in an empty room out of the elements, how will I be able to handle it on the trail? I can’t be the only one freaking out, can I? Am I? Let’s take out of the equation leaving your job, hiking the trail, and uprooting your life altogether. Simply selling a house is a stressful feat within itself. I was ready to put my house on the market in February. The universe was not. I had a leak in my roof and had to get it replaced. Also stressful, right? Then my car needed some major repairs. My stepdad suddenly had a seizure in December and had to have brain surgery and lengthy radiation for a golf ball-sized tumor we had no clue about. I was able to manage all of this and keep it moving. Wanna know what uprooted my sanity? Deciding on what tent I’m gonna live in for the next sixish months: Easy peasy lemon squeezy. Deciding on if I’m gonna cut my hair for the trail: Heart palpitations and about 15 new gray hairs. My goal was to have enough hair to have two French braids for the trail. I had an undercut that I had to grow out and it was well on its way. Except the longer my undercut grows, the curlier it is becoming. So ultimately, the longer it gets, the shorter it gets. The awkward stage of kinda fitting in a ponytail only to shimmy out minutes later is where I live now. So I have to decide if I’m going to cut it all to the shoulders and love my buff or stick with my original plan. How is it possible that such a small factor in the grand scheme of my trek prep is having such a huge affect on my zen? After the freak-out about the gear and haircut, I chose to change my perspective. Girl, keep it simple. I will figure my gear out. My gear will figure me out. IT DOESN’T HAVE TO BE PERFECT. And certainly not right away. The trail will be what it will be. My reasons for hiking the trail have nothing to do with pretty pictures of my gear and how my hair looks. The screaming fire alarm helped me recall my trail purpose. Attention! Please remain where you are. Except that I can’t. There’s a world out there. And I’ve gotta see it.